TV Girl: "Um, Affleck please. Hold the Ben." 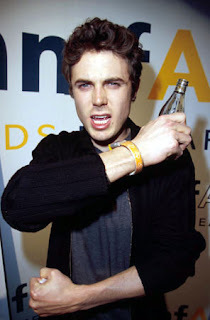 Casey Affleck has always been one of my favorite actors. Since the forgotten days of a movie (that I love, by the way) called Committed to the hard-hitting success that comes with killing Jesse James, that other Affleck kid is, unlike his big brother, the very essence of the cat's meow. He knows how to bring it, and when he does, he doesn't only bring it a little, he brings it hard. But it's not Collin Farrell or Harrison Ford hard. It doesn't usually involve any sort of cinematic heavy-lifting, massive swearing, bazooka-blowing, or terrorist sucker-punching. It's a hard that comes in the form of something so many young actors lack nowadays: subtlety. Casey Affleck doesn't bite into his roles, he flutters just beneath them, a candid presence that winks and smiles, shrugs, blinks, breathes real air. His presence seems to crawl out of the woodwork, to absorb effortlessly into the situation at hand. Casey Affleck always manages to steal the show, even when his character is just a piece of the decor. I'll always remember him best for his turn as goth stud Tom in 200 Cigarettes. This role stole my heart. I can't ever remember being more enamored by an emo punk with black hair and earrings. He brings a certain vulnerability to his characters, a vulnerability that droopy-eyed Jake Gyllenhaal could really learn from. It's not all about lovelorn looks and sloping back pasture. It's about making an audience empathize. It's about embodying an everyday man demeanor while still managing to conquer the screen. This quality is best exemplified, perhaps, by Casey's character in the grossly overrated Gone Baby Gone, in which he plays a young private detective. Affleck's character in Gone Baby Gone has skin tough as leather, but under the surface dwells an ocean of frailty. His performance makes a movie like this look weaker than it already is. Gone Baby Gone was full of excellent performances. Ed Harris is his usual grand and imposing self, and Amy Ryan is brave and strangely likable as the crack mom who neglects her young daughter. Casey Affleck is a reservoir of emotion. He's rarely frightened, but it's not because he's brave. He's headstrong, seasoned in the ways of a Bostonian thug, and, unlike many current Hollywood actors (ahem...Ben), he wields his gun as a weapon rather than as a large phallus. As a film, Gone Baby Gone was, I thought, run of the mill. Confusing, and not in a good way, not Michael Clayton confusing, but just confusing. Many of the characters, while their actors put on tremendous shows, seem completely inconsequential to the plot. The plot itself is boring and holds little gravity, and the writing is painfully, painfully thin. The dialogue is okay, but the story is overdone and predictable, certain elements are tossed aside, some lost forever, some returning in the end to an audience of eyebrow raises. There were times when I thought to myself, This movie wants to be Spartan starring Val Kilmer. It wants to so bad, but it's not. Not once did I find myself entranced with anything in Gone Baby Gone other than the underrated talent of Casey Affleck. In fact, if there's any reason I didn't just turn the movie off at the one hour mark, it's him. This only goes on to prove my point that Ben Affleck is an overrated turd, and while I like him in his early stuff, some of the Kevin Smith movies (especially Dogm a) and that hilarious quip he pulled for Shakespeare in Love, he's just no Casey. He directed Gone Baby Gone, and it was fine. We're not talking the future Paul Thomas Anderson here, or Sam Mendes for that matter, we're talking f-i-n-e. Some shots were original, most were, much like the movie they comprise, run of the mill. The script, also penned by Ben Affleck (and Aaron Stockard, whoev that is), was, however, mediocre. It reminded me of Freedomland with a few upgrades, and wow, did that movie bite it. Ben Affleck obviously thinks he's reached a Sean Penn, George Clooney point in his career, and that he can simply transcend the actor status and move onto things like directing. Unfortunately for Ben, however, Sean and George both have Oscars in addition to their rugged handsomeness, and without Matt Damon, Ben's screenwriting is, to put it nicely, uber-drab. There is good news for Ben, however, because if he can keep getting little Casey to star in his stuff, maybe one day he'll make something great. Until then, I prefer Casey. I prefer him quite sweetly and quite finitely. There will always be a tender place in my heart for Holden McNeil and Ollie Trinke, but my love for great acting will not be denied, and at the end of the day when I'm on my way home, and I'm praying to the gods of video rental that someone has finally returned a copy of The Assassination of Jesse James by the Coward Robert Ford, I have to admit it: Casey wins.